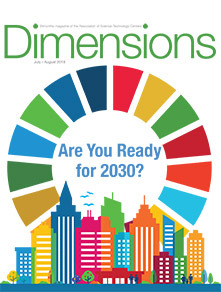 A feature article on the TSL international schools essay competition and debate, Kids Do The Write Stuff by our executive director Karl Hansen, has just been published in Dimensions magazine by the US-based Association of Science Technology Centers. Accompanying the article, the current issue also features the Grand-Prize-winning essay by the 11-year-old ‘junior doctor’ Veda Fernandes, Letter from a doctor. To access the articles, see below.